It’s unlikely Chicago Public School students’ teachers will be in class Friday. The Chicago Teachers Union is planning a "day of action" with rallies and protests to take place from early morning through the evening. But is this one-day strike actually legal? According to CPS CEO Forrest Claypool, the teachers are breaking the law by walking out of their teaching duties Friday. He says CPS will legally challenge the move with the Education Labor Relations Board which could result in some sort of fine or punishment for the union, if the board finds in CPS’ favor. Claypool expressed his dismay that 340,000 students would be without a day of class because of it. “Chicago Tonight” asked Claypool, then, why not bring legal action sooner to prevent the walkout and force teachers back into the classroom? The rules state that a certain fact finding period has to happen before a teachers’ strike can take place. The union points to a provision in national labor law that allows them to strike over unfair labor practices. They say that taking away yearly raises constitutes is an unfair practice. But CTU Vice President Jesse Sharkey admits he’s not 100 percent sure if the union is on legal ground. But he says its beside the point. ​And for parents needing to drop off their kids, CPS will have 250 school, park district and safe haven sites open for kids to spend the day at. There will be online learning programs, physical education, arts and crafts classes, and other things to keep them occupied. All Charter Schools will be open for class. And there will be free rides for CPS students on the CTA Friday. Claypool says that he’d rather see CTU join forces with CPS to get more funding out of Springfield. “Instead of forcing our students to miss out on a day of learning, we need to work together to fix a broken state funding system that penalizes poor and minority children, something we’ve been asking CTU leadership to do with us for more than a year,” he said. There has been some confusion as to what exactly the strike is about. It started as an action over Claypool’s announcement that he’d make teachers pay their full employer pension contribution, but then CPS backed off. Then, the strike was about teachers missing out on raises. But the union has said recently the strike is about everything – it too wants more funding from springfield. Mayor Rahm Emanuel and Claypool have called for $500 million in more funding from the state. Gov. Rauner and Senate President John Cullerton supported elements of it, but House Speaker Michael Madigan squashed the bill in the house last year. Madigan and the CTU felt that it might provide short term relief but jeopardize long term funding. The teachers union heavily helped Madigan’s reelection, we’ll see if they now hold his feet to the fire to come up with more funding. Related stories from "Chicago Tonight"
March 29: Parents of Chicago Public Schools students still searching for alternatives to attending school this Friday will have their pick of 262 contingency sites announced today by the district. 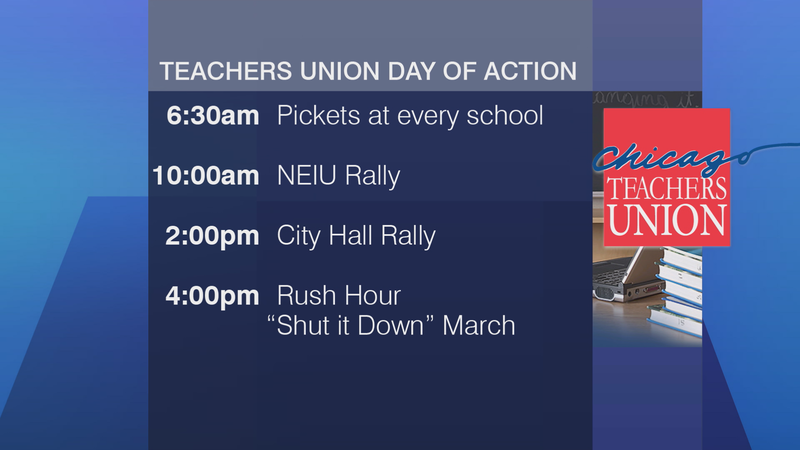 Meanwhile, the Chicago Teachers Union has released a tentative schedule of events, which includes picketing schools and rallying downtown during rush hour. March 28: Chicago public school teachers will go on a one-day strike this Friday that may or may not be legal. Chicago Public Schools Chief Forrest Claypool joins “Chicago Tonight” to talk about the upcoming one-day teachers strike and what parents should do. March 24: The Chicago Teachers Union says the vote for a one-day strike passed overwhelmingly. But a vocal minority still opposes it.